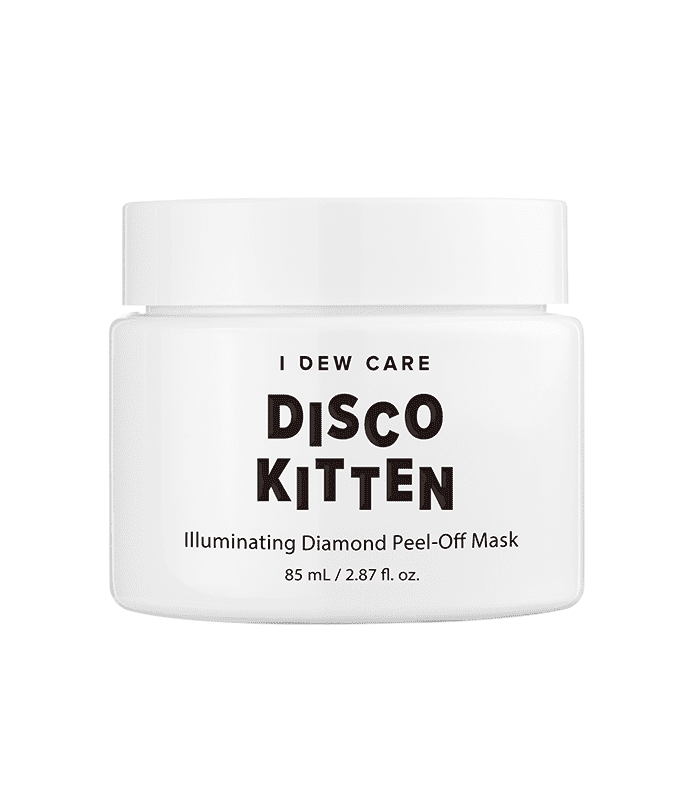 As I’m writing this, I’m seated at my desk wearing I Dew Care’s hero chrome product, the Disco Kitten Mask ($23)—named to describe the glittery finish. It’s sold out not once but twice since its launch last month, and I believe it’s my civic duty to find out what all the fuss is about. Upon first inspection, the mask is super thick, goopy, and has a pearlized tint to it. Turns out pearl powder is used to gently exfoliate your skin and brighten the complexion, while diamond powder boosts elasticity and removes impurities. I washed my face, patted it dry, and (generously) smoothed the mask on and walked back to my desk. FYI: This is what I look like right now. Aside from the weird looks from co-workers, everything feels pretty good. The mask went on cool and invigorating (into it) and after, about, 20 minutes feels tight on my face. I decide to leave it on for 10 more minutes because the directions say 20 to 30—a girl's gotta get her money's worth. After peeling it off (and videotaping the entire experience for Instagram, naturally), I definitely noticed a brighter, more luminous quality to my skin. The rice bran extract delivers vitamins that moisturize and improve your skin's texture, and lily, jasmine, orange flower, elderflower, and magnolia enrich your skin with vitamins for better tone and softness. The mask left my skin a bit red, which reminds me of the pore-cleansing effects of the similarly popular Glamglow Supermud Clearing Treatment ($69). In the end, my skin looks great, and I had so much fun peeling it off. If you have sensitive skin, though, I'd make sure to follow it up with your most hydrating moisturizer to avoid irritation. I used La Mer's Crème de la Mer Moisturizing Cream ($85), but Glossier's Priming Moisturizing Rich ($35) has a similar quality for far less money. At the time I decided to write this review, the product had been restocked online at Ulta Beauty. Now, just a few hours later, it's sold out again. I have it on good authority it will be restocked soon (and if you sign up for an alert, you won't miss it). Until then, try Charlotte Tilbury's Goddess Skin Clay Mask ($55) because it yields, you guessed it, goddess-like skin. Next up: Read about the BB cream that basically gave me a "skin transplant."